I folded some paper, too. 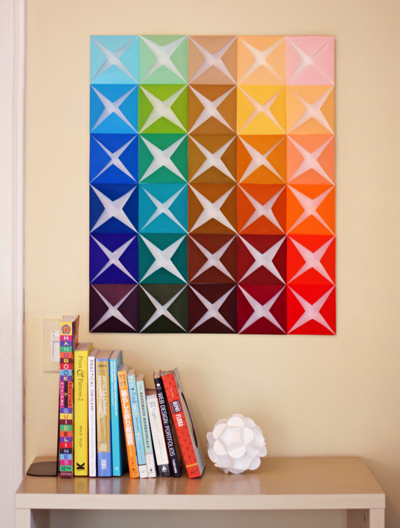 For an easy wall art project, try folding squares of colored paper and arranging them in a grid. I used part of a pack of multi-colored origami paper for this, but you could use any colored papers that match your room or your shop. It's cheap, simple, and the 3D sculptural look is fun. Find the center point on a square of paper by bending it in half and pressing a crease at the midpoint. 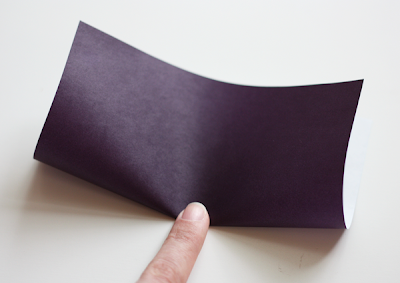 (Don't make a sharp fold along the entire length.) Open the square, rotate 90 degrees, and repeat. The center of the square is where the two creases meet. Fold each corner of the square to the center point. 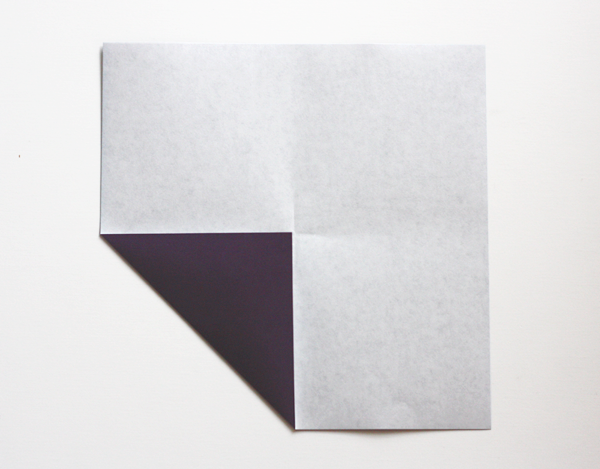 When you've got a collection of squares folded, arrange them on a piece of foam board or cardboard and secure them in rows with double-stick tape. Done! I would love it if someone would cover an entire wall with white squares. The light and shadows would be beautiful. Though that wall would be easily smooshed when a person leaned against it, alas. 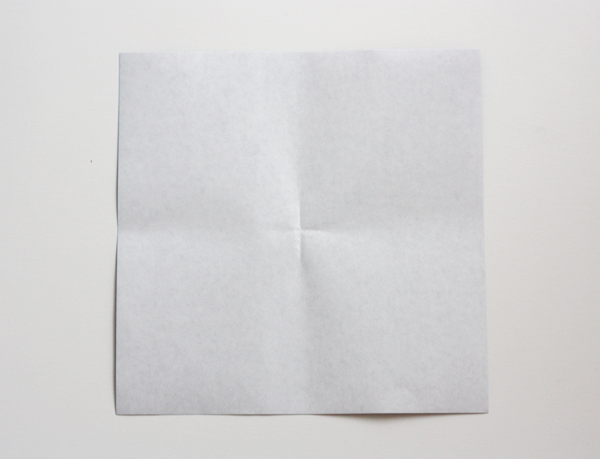 To make the paper ball in the photo, click here. Welcome back! Gee, what a simple but beautiful idea! Oh I love it! I see a quilt with that design in the future! They look so pretty grouped together like this. Look at you still doing projects during your vacation. I bet you were thinking up blog ideas the whole time. Great look! I wonder how it would look in fabric??? I may have to try it. Welcome back! 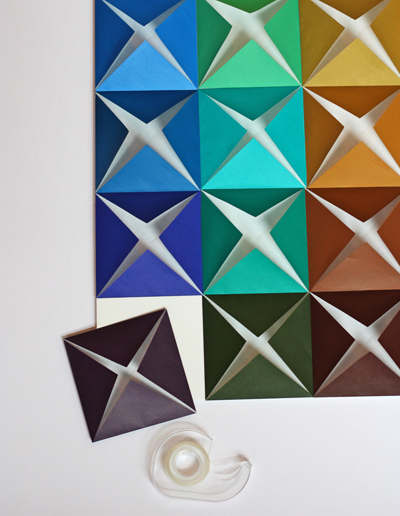 What a great project to highlight the rich colors and patterns in origami paper! Welcome back, this is such a super and simple idea. I see an ombre wall using this technique. Thanks for the idea. This is great! I can do it with my niece this weekend, with my students at school! Glad you had such a lovely rest. The origami is delightful. This is great, the colors just beautiful! Had to Pin! It's lovely and so simple. My daughter did a very similar thing with smaller pieces of origami paper, which I framed. You've gotta love DIY affordable art! This looks really nice and happy!! Thank you for sharing this lovely idea! so simply and so beautiful! Oh that is seriously eye-catching! I love it...nice job! Coming over from Emmaline Bags & Patterns. Hurray for more modern, clean & simple papercrafts! My new apartment still has bare walls, I do not own any art, and I can make that in 1/2 hour easily. Hmmmmmmmm...! I like the white on one side and the color on the other (really makes it). Lovely tutorial! I have linked to it on my blog - ajperspective.com/blog! Thanks! Beautiful! And so very easy!! I think the white wall would look great as well! I used to make these in middle school as lil' fortune teller readers, did you ever make those? waw! I love it, I will try. @cindyann I wondered the same about fabric and my son and I tried to recreate this collage with some felt from the craft store. It doesn't quite have the same geometric outcome because felt is so heavy and droopy, but I still think it looks great. What did you do to hang it on the wall? I just used blue painter's tape on the back, since that's it's temporary location. If I wanted it there "for real," I'd probably glue one or two sawtooth picture hangers on the back and hang it on nails. No, wait. I'd place a string across the back like a picture wire, tape it down on each end, and hang that on a nail. I have a question: Does the paper droop after hanging for a while or does it hold it's shape? Love the idea! This has made a rainy day into a not so rainy day. My kids and I have created a number game with it. What a fun way to make something everyone can enjoy. next time we are using pictures of our family and were going to play the match up game. Parent to child, Sibling to Sibling. My kids love that I make the colors sparkle. I add glitter to almost everything. Wow, you did it! It's terrific! Thanks for sharing the link, Joyce! My yr3/4 art club loved making this wall art. We glued the squares to a heavy paper, hung them up on the display board where they stayed for the next few weeks.